pavement frippery: Here we go. Ok, so from now on whenever I find something I really want to buy I'll post it on this blog instead of actually buying it. Then I'll be rich. 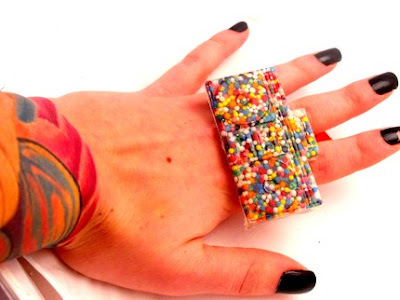 First up is a knuckle duster, two-finger, cupcake sprinkle, boom box ring. How could it possibly be bad? Being sold by Sweet Lobe on Etsy and it's only 8 green ones.